The 200-86000 2D Ultrasonic Anemometer offers high performance, low cost, and compact size. Loaded with standard options, this sensor is ideal for the most demanding sensing requirements. 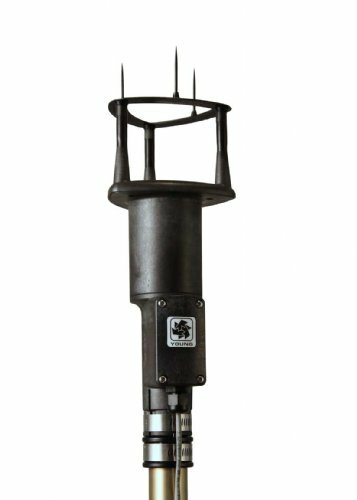 The 200-86000 2D Ultrasonic Anemometer offers high performance, low cost, and compact size. Loaded with standard options, this sensor is ideal for the most demanding sensing requirements. It features durable, corrosion-resistant construction with sensitive ultrasonic transducers secured in a streamlined molded frame. The 200-86000 is fully wind tunnel tested and calibrated to provide reliable, accurate wind measurement. Standard outputs include analog voltage output and RS232 serial connections. For use in industrial settings where noise immunity is important, calibrated 4-20 mA current and RS485 serial outputs are also included. A variety of serial data formats are provided including ASCII text, RMYT (compatible with RM Young displays), and NMEA for marine use. SDI-12 model also available. For extended cold weather use, the 200-86004 features thermostatically controlled heaters in transducer and housing surfaces. Wind speed range reduced with the heated model. The 200-86000 installs on readily available 1-inch (lPS) pipe. Cable wires connect to convenient, reliable terminals in a weather-proof junction box; special mounting adapters, connectors, and cables are not required.